My 50+ Valentine Day Ideas post was a very big hit, so I have put together a round up of 50+ St Patrick Day Ideas and I have also decided to add a linky party so you can link up your St Patrick Day Ideas as well. 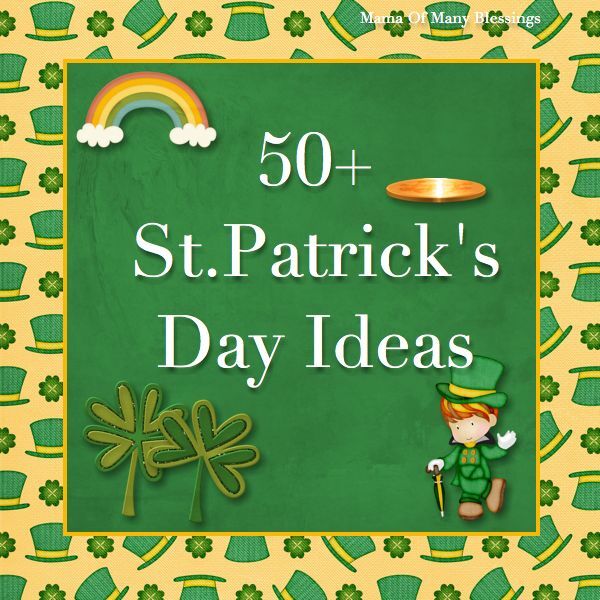 This list of ideas has something for everyone from St. Patrick Day Craft Ideas, St. Patrick’s Day worksheets, St. Patrick’s Day lesson plans, Leprechaun and Shamrock printables and ideas, St. Patrick’s Day activities, some great FREE printable St. Patrick’s Day coloring pages, St. Patrick’s Day games, and more!! 1. Last year I shared some of our tot drawers, tonging green coins into the pot was one of the activities. 2. Pouring green gems from 1 container to the other. 3. We had fun making St Patty Day Patterns. 4. Cutting Strips are always a favorite in this house so we always get out our St. Patty Day Cutting Strips. 5. We had fun making these books last year which taught the kids what St Patrick’s Day is about. 6. EdHelper offers lots of St Patrick’s Day educational printables. 7. Digging for Lucky Coins was one of the boy’s favorite sensory bins!! 8. The kids had lots of fun making these St. Patrick’s Day boxes last year for our Friday Art Project! 9. Rockabye Butterfly shared this cute and easy sticky shamrock easy enough for your toddlers & preschoolers, she also shares a few different St. Patrick’s Day printables! 10. Making Learning Fun has this fun and easy shamrock craft idea using paper plates. 11. Chica and Jo share this cute idea of growing clovers in a plastic pot! 12. Nurturing Naters with learning activities at home shares this cute St. Patrick’s Day Sensory Bin. 13. Thoughtfully Simple shares this cute “lucky breakfast” idea that would be fun for St. Patricks Day breakfast. 14. The Food Librarian shares this festive looking green jello recipe, perfect for a yummy St. Patrick’s Day snack! 15. Rockabye Butterfly shared this FREE printable file folder game for St. Patrick’s Day. 16. Little Country Kindergarten has this fun FREE printable St. Patrick’s Day hundreds chart. 17. Alpha mom shares this idea on making a St. Patrick’s Day hat out of a paper plate, along with hat ideas for other holidays! 18. The First Grade Sweet Life shares this FREE Leprechaun Homophone Concentration game. 19. Deb at Living Montessori now shared these Counting Shamrocks along with other Montessori St. Patrick’s Day Activities. 20. Inner Child Fun shared this adorable St. Patrick’s Day rainbow craft! 21. Housing A Forest shared this great idea of making Shamrock Crystals, that would be a fun St. Patrick’s Day Science Idea! 22. Kids Activity Blog shared this fun and festive way to make easy shamrocks using peppers. 23. Kreative Activities shares this green dry rice pouring that would be a great themed practical life activity using green colored rice. 24. Paging Supermom shared this grear FREE printable for your kids to practice writing St Patrick’s Day words, they also have a connect the dots and tracing page for St. Patricks day. 25. Make your own St. Patrick’s Day window clings, shared over at Crafts by Amanda. 26. Make your own rainbow fruit tray. 27. Busy Bee Kids Crafts shared this fun idea for making a Lucky Charm Necklace. 28. Amanda’s cookin shares these beautiful shamrocks, gold coins, and rainbow cookies on a stick. 29. Play and Learn With Dana shared this cute art project idea, even simple enough for a toddler. 30. 2 Teaching Mommies shares this wonderful St. Patrick’s Day printables which includes Clover Letter Match, Leprechaun Beginning Writing, Clover spelling Puzzle, pot o’ Gold Roll & Cover, How Many Coins, and more!! 31. Make some festive Leprechan floats using green sherbert and sprite shared over at Make And Takes. 32. Practice fine motor skills with colored bingo chips and make a rainbow. 33. Make a green lunch for your kids for St. Patrick’s Day! 34. Kroma Design Studio shares this yummy looking St. Patrick’s Day dessert pudding. 35. Sifting shamrocks would be a fun tray activity! 36. Counting Coins Leprechaun busy bag idea. 37. Making Learning Fun shared these cute St. Patrick’s Day do a dot and magnet page. 38. The Activity Mom shares the FREE printables for these St. Patrick’s Day story starters. 39. Child Care Land shares this simple craft for kids to make for St. Patrick’s Day using paint chips. 40. Play Doh rainbow would be a great addition for St. Patrick’s Day from I Can Teach My Child. 41. Classroom Freebies Too shares this FREE download of 168 traceable flashcards with numbers and letters with shamrocks perfect for St. Patrick’s Day! 42. Activity Village offers some cute St. Patrick’s Day bead fuse patterns, my kids love making these the site has a few different designs for St. Patrick’s Day! 43. Learning English ESL shared this FREE Leprechaun printable. 44. Mom on Dealz shared this cute idea for shamrock tortillas, perfect for St. Patrick’s Day lunch or dinner! 45. Savvy Saving Couple shared the recipe for this green slime that would be a great idea to make for a St. Patrick’s Day sensory idea! 46. Featuring Your Sassy Sites shared this cute St. Patrick’s Day hat tutorial. 47. Adventures In Tutoring and Special Education shares this FREE printable for Lucky Charms graphing, it would be a fun way to practice math on St. Patrick’s Day! 48. Art Projects For Kids shares how to make a shamrock! 50. These green colored animal crackers would make a great snack for St. Patrick’s Day shared over at Scrumdilly-Do. 51. Holidaysville shares a bunch of Kids St. Patrick’s Day craft ideas, something for your toddler through older kids! 52. Growing a Jeweled Rose shared this Lucky Leprechaun Lab that would be a great addition for St. Patrick’s Day for you bath! 53. Hello Kids shares this FREE printable coin box, great for your kids to keep their Fairy gold in! 54. Play Dr Mom shares this adorable idea of growing leprechaun hair, and some other cute St. Patrick’s Day ideas for your kids! 55. Make some green St. Patrick’s Day pasta and a green drink. 56. We had lots of fun playing with this green goo sensory bin. 57. This rainbow sensory bin idea was a lot of fun for the kids. 58. Rainbow art with rainbow rice was simple and fun for the kids to make. 59. Waterbeads, coins, and water made this a very fun sensory bin idea! Our St. Patrick’s Day idea page has all of the fun St. Patrick’s Day ideas we have shared on the blog over the years, stop over and check out all the fun ideas!! For more St. Patrick Day ideas visit my St. Patrick’s Day Pinterest board. Follow Mama Of Many Blessings’s board St Patrick’s Day Ideas For Kids on Pinterest. Hope to see you there and have a totally awesome day!! Thanks for stopping by! I will be checking out your Let’s Get Social Sunday link up on Sunday, thanks for letting me know! Hope you have a wonderful week!! Hi, I’m Shasta from LinkyHere.com (a link party directory) and I love your link party idea. I’ll be sharing it via our social media sites. Good luck! Thanks for your compliment about the new linky party!! Also thank you for sharing on your social media for us!! Wishing you a wonderful week! So many great ideas for St. Patty’s Day. I linked up and thanks for sharing all these ideas on We Made That! Thank you for your kind words, and for hosting and for taking the time to stop by! I love your ideas, thanks for linking them up! Have a wonderful weekend!! Wow, such a diverse set of ideas. They all look so fun. Thank you for stopping by and for your compliments. I appreciate you hosting Kids Get Crafty I find some great ideas there!! Hope you have an amazing weekend! Those are such fun ideas! Definitely saw a few I want to do with my little ones. Thanks for putting together the list and sharing! New follower stopping by from the We Made That Linky. Thank you for stopping by from We Made That Linky and taking the time to stop by! I so glad you were able to find some ideas to try with your little one! Have a blessed weekend! sorry, the first link (the really long one)is a bad link and i have not been able to get it to work, but it is a link to Oriental Trading Company (orientaltrading.com)for the Tissue Paper Shamrock Craft Kit that they sell. It is $9.95 for a kit that makes 12. I have not seen so many St. Patty’s Day ideas in one place – thank you!!! Fantastic Set of Activities and ideas. Thank you so much for linking up to Tuesday Tots and just letting you know that I’m featuring these over on Rainy Day Mum this week. What a list! Thanks so much for putting it together. I’ll be back to check out some more ideas and link up my own St. Patrick’s Day posts whenever I get them up. Awesome post! So many great ideas here! I will be featuring this on The Sunday Showcase this week. Found your site via LinkyHere, Thanks for hosting the link party (my first) I linked up 101 St. Patricks Day Activities, Recipes and Crafts and I started to follow you on twitter to stay upto date. Thanks for asking me to link up! I love all the ideas! Wow! So many great ideas around here!